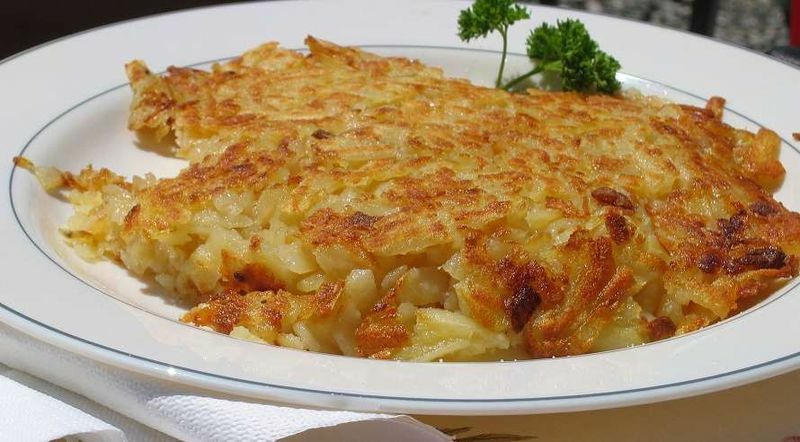 Rösti (often spelled Röschti in Swiss German) is a Swiss dish consisting mainly of potatoes. It was originally a common breakfast eaten by farmers in the canton of Bern, but today is eaten all over Switzerland and also in many restaurants in the Western World. Many Swiss people consider rösti a national dish. Today, rather than considering it a complete breakfast, it is more commonly served to accompany other dishes such as Cervelas or Fleischkäse. Rösti is made with potato which are grated and depending on the frying technique, possibly mixed with some butter or fat (and usually salt and pepper), or fried in oil later. The grated potatoes are then shaped into rounds or patties, which come in different sizes usually measuring between 3-12 cm (1 to 5 inches) in diameter and 1-2 cm (0.5 inch) thick. Often the Rösti is simply shaped inside of the frying pan. They are most often shallow fried but can also be baked in the oven. Although the basic Rösti consists of nothing but potato, a number of additional ingredients are sometimes added, such as bacon, onions, cheese, apples or fresh herbs. This is often considered to be a regional touch. There are different views on what makes a perfect Rösti. The greatest difference of opinion is whether to use raw or boiled potatoes as the main ingredient. Also, the kind of potato which makes the best Rösti dish is widely disputed. Traditionally a special type of potato (the Rösti potato) is used for Rösti.